Calling all Tripawds! Come show your Tripawd Pride and participate in a fun new project, the Tripawds Tribute Leash. Tripawds members have often discussed creating some kind of traveling tribute item to honor our animal friends, that we could display at events like the upcoming Morris Animal Foundation Walk in California. Well, Spirit Tri-Pug Maggie’s Mom, Karen, recently came up with a great tribute idea, and based on input from others, the Tripawds Tribute Leash idea was born. The Tripawds Tribute Leash Project: Join Us! We are creating the first traveling Tripawds tribute. All Tripawd canines, felines and quadpawd family members are invited to join in! The idea is to pay tribute to all members of the Tripawds community. This leash will honor those who are still on the journey and remember those who have crossed the bridge. We decided on a Tripawds yellow leash with a ribbon tied on for each animal who is a member of the Tripawd community. 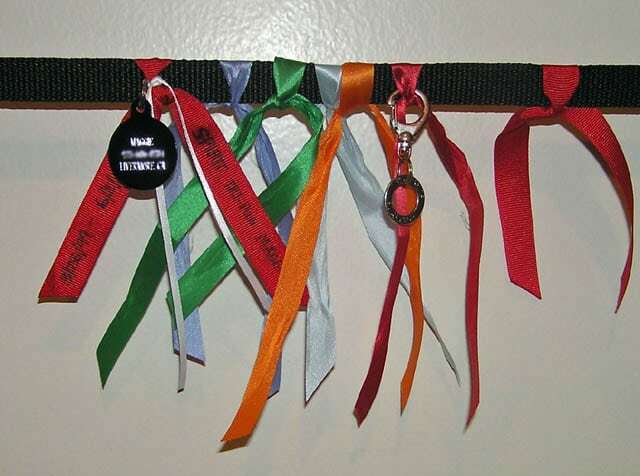 Every member of the Tripawds community is welcome to send a ribbon to be added to the leash. The Tribute Leash will be sent to different events around the country where Team Tripawds is being represented. We will continue to add ribbons, and new leashes as needed. 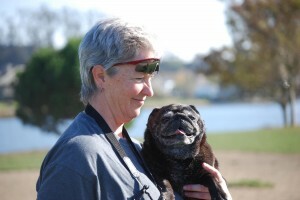 For now, the Tribute Leash will reside in Livermore with Spirit Tri-Pug Maggie’s Mom, Karen. The plan is to debut the leash at the Morris Animal Foundation Walk in Elk Grove in April. After this event, other members around the country can request it for their special event or Tripawds-related activity. Use a piece of ribbon, any color; pick something that represents your animal friend. We want lots of color! Something sturdy is recommended, as the leash will be carried in walks, and shipped at least a few times a year. The suggest ribbon width is ¾ to 1 inch. Anything wider may not tie neatly. The ribbon should be at least 12 inches long, maximum of 18 inches long. Using an indelible pen (fine point sharpie works well) write your fur kid’s name, your name (optional) and any message you would like. Perhaps you would put dates, or nicknames, or a short tribute. You can write on both sides of the ribbon. Leave the center 4 inches clear of any writing; this is the part that will be tied around the leash. You may send a SMALL trinket or remembrance to attach as well, but it is not necessary. A tag is one idea. Some pet stores have machines that allows you to engrave a tag with anything you like. When you mail your tribute be sure to include a note with your name, your animal’s name, and your Tripawds User Name just in case Karen has any questions. The ribbons and trinkets will be tied around the leash in the order received (except that Jerry will be first!). Angel and Spirit Tripawds will have a small piece of white ribbon attached when tied on to the leash. We can’t promise that ribbons received after April 20 will be included in time for the 2012 Morris walk, but they will definitely be added to the leash afterward for future events. Please contact us for the mailing address. Paws up to Karen for volunteering to head up this project. If you have a great idea to honor Tripawds and their families, don’t be shy! Contact us today! planning on sending something. just saw this. how is this project doing? Cool, we can’t wait! There’s a photo of the leash in this blog post. Great idea Karen! We’ll get you a ribbon by April 20th to represent Sierra. See you on the 29th! Great idea! I’ll try to get this all together in time…do you supply the white ribbon for the angel tripawds? I’d like to remember our “Luna”, that would be great! My plan was to supply the white ribbon, but if you have something in mind you can send it. Great idea . . . how about using this as a fundraising tool – offer to make ribbons in honor of donors’ tripawds/quadpawds for a contribution to the walk of say $5 or something similar? I would be glad to make some ribbons, probably other Elk Grove walkers would be also . . . ? Hi Cindy & Ruby! That’s so nice of you. I think we’ll keep this simple right now though, and say anyone who wants to support Team Tripawds on the Morris walk can do so here. Your idea could work for future events though. oooh, gayle will be represented!! what a great idea, can’t wait to see the results.